From the purchase of 110 James in March 2017 to a grand opening scheduled for fall of this year, Accel North firmly solidifies Niagara’s place on the Canadian Tech Corridor map. 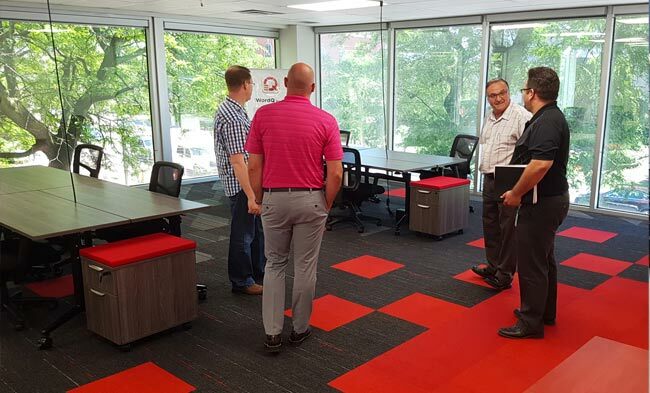 St. Catharines native and Clickback CEO, Kyle Tkachuk’s vision of creating a technology and innovation hub in Niagara has become a reality. This includes the build-out of the first Tech Accelerator, Accel North, with founding partner Dino Miele. 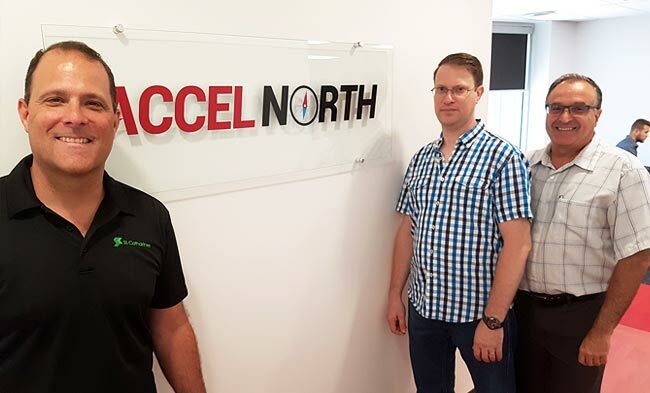 On July 3rd, Mayor Walter Sendzik and Brian York, Director of Economic Development & Government Relations for the city of St. Catharines as well as Rob Belchior, Small Business Consultant & Manager for the city of St. Catharines paid a visit to Accel North. The purpose of the visit was to get an update on the progress of the building. The iconic building at the corner of James and Church Street. 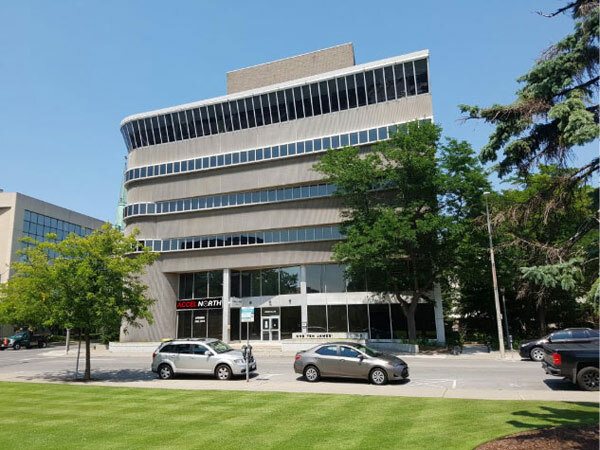 in downtown St. Catharines has been completely overhauled into a centre for tech innovation and entrepreneurial acceleration. The 2nd floor of the building has been renovated from the ground up to provide a modern workspace for technology companies in acceleration mode. Officially named Accel North, this tech accelerator is Niagara’s first, and a big reason why Mayor Sendzik is so excited about what’s happening at 110 James. The guests were very impressed with the work that has been accomplished in such a short time. Six companies in scaleup mode have already confirmed their residence in the building this week. The entire building has been revitalized to a centralized hub where technology and innovation can flourish in the Niagara Region. 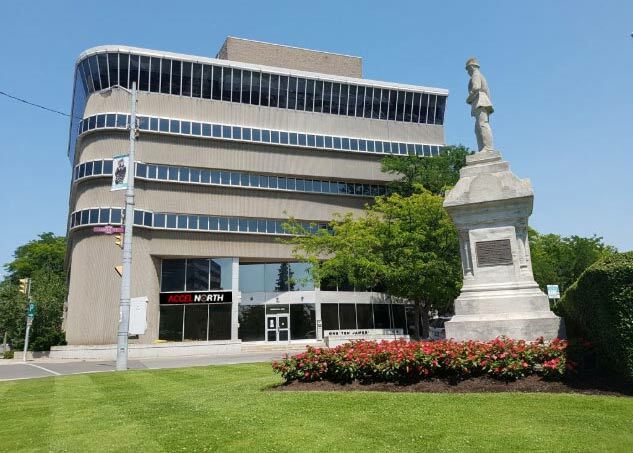 The 1st floor is currently in progress with concepts that include several positive economic benefits for the City of St. Catharines, and the Niagara Region. The 3rd floor of The Clickback Hub includes 7 private scaleup suites to tech companies that want to move to their own private space from the second floor. The 6th floor of the building is home to the established cloud-based software company, Clickback, which provides B2B lead generation solutions for businesses worldwide. The grand opening of the Clickback Hub is scheduled for fall 2018. Stay tuned! Learn more about the history of Clickback.